A dull and foggy day with a drizzle of rain. The house is banked in with rolling clouds, which rise now and then to show the dreary curves of the moor, with thin, silver veins upon the sides of the hills, and the distant boulders gleaming where the light strikes upon their wet faces. It is melancholy outside and in. The baronet is in a black reaction after the excitements of the night. I am conscious myself of a weight at my heart and a feeling of impending danger — ever present danger, which is the more terrible because I am unable to define it. And have I not cause for such a feeling? Consider the long sequence of incidents which have all pointed to some sinister influence which is at work around us. There is the death of the last occupant of the Hall, fulfilling so exactly the conditions of the family legend, and there are the repeated reports from peasants of the appearance of a strange creature upon the moor. Twice I have with my own ears heard the sound which resembled the distant baying of a hound. It is incredible, impossible, that it should really be outside the ordinary laws of nature. A spectral hound which leaves material footmarks and fills the air with its howling is surely not to be thought of. Stapleton may fall in with such a superstition, and Mortimer also, but if I have one quality upon earth it is common sense, and nothing will persuade me to believe in such a thing. To do so would be to descend to the level of these poor peasants, who are not content with a mere fiend dog but must needs describe him with hell-fire shooting from his mouth and eyes. Holmes would not listen to such fancies, and I am his agent. But facts are facts, and I have twice heard this crying upon the moor. Suppose that there were really some huge hound loose upon it; that would go far to explain everything. But where could such a hound lie concealed, where did it get its food, where did it come from, how was it that no one saw it by day? It must be confessed that the natural explanation offers almost as many difficulties as the other. And always, apart from the hound, there is the fact of the human agency in London, the man in the cab, and the letter which warned Sir Henry against the moor. This at least was real, but it might have been the work of a protecting friend as easily as of an enemy. Where is that friend or enemy now? Has he remained in London, or has he followed us down here? Could he — could he be the stranger whom I saw upon the tor? I went at once to my room and drew up my report of the morning’s conversation for Holmes. It was evident to me that he had been very busy of late, for the notes which I had from Baker Street were few and short, with no comments upon the information which I had supplied and hardly any reference to my mission. No doubt his blackmailing case is absorbing all his faculties. And yet this new factor must surely arrest his attention and renew his interest. I wish that he were here. All day today the rain poured down, rustling on the ivy and dripping from the eaves. 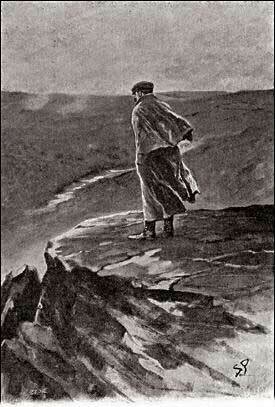 I thought of the convict out upon the bleak, cold, shelterless moor. Poor devil! Whatever his crimes, he has suffered something to atone for them. And then I thought of that other one — the face in the cab, the figure against the moon. Was he also out in that deluged — the unseen watcher, the man of darkness? In the evening I put on my waterproof and I walked far upon the sodden moor, full of dark imaginings, the rain beating upon my face and the wind whistling about my ears. God help those who wander into the great mire now, for even the firm uplands are becoming a morass. I found the black tor upon which I had seen the solitary watcher, and from its craggy summit I looked out myself across the melancholy downs. Rain squalls drifted across their russet face, and the heavy, slate-coloured clouds hung low over the landscape, trailing in gray wreaths down the sides of the fantastic hills. In the distant hollow on the left, half hidden by the mist, the two thin towers of Baskerville Hall rose above the trees. They were the only signs of human life which I could see, save only those prehistoric huts which lay thickly upon the slopes of the hills. Nowhere was there any trace of that lonely man whom I had seen on the same spot two nights before. He wanted to know the object of my inquiries, but I managed to satisfy his curiosity without telling him too much, for there is no reason why we should take anyone into our confidence. Tomorrow morning I shall find my way to Coombe Tracey, and if I can see this Mrs. Laura Lyons, of equivocal reputation, a long step will have been made towards clearing one incident in this chain of mysteries. I am certainly developing the wisdom of the serpent, for when Mortimer pressed his questions to an inconvenient extent I asked him casually to what type Frankland’s skull belonged, and so heard nothing but craniology for the rest of our drive. I have not lived for years with Sherlock Holmes for nothing. I have only one other incident to record upon this tempestuous and melancholy day. This was my conversation with Barrymore just now, which gives me one more strong card which I can play in due time. Mortimer had stayed to dinner, and he and the baronet played ecarte afterwards. The butler brought me my coffee into the library, and I took the chance to ask him a few questions. “Selden told me of him, sir, a week ago or more. He’s in hiding, too, but he’s not a convict as far as I can make out. I don’t like it, Dr. Watson — I tell you straight, sir, that I don’t like it.” He spoke with a sudden passion of earnestness. Barrymore hesitated for a moment, as if he regretted his outburst or found it difficult to express his own feelings in words. “Very good, Barrymore. We may talk further of this some other time.” When the butler had gone I walked over to the black window, and I looked through a blurred pane at the driving clouds and at the tossing outline of the wind-swept trees. It is a wild night indoors, and what must it be in a stone hut upon the moor. What passion of hatred can it be which leads a man to lurk in such a place at such a time! And what deep and earnest purpose can he have which calls for such a trial! There, in that hut upon the moor, seems to lie the very centre of that problem which has vexed me so sorely. I swear that another day shall not have passed before I have done all that man can do to reach the heart of the mystery.